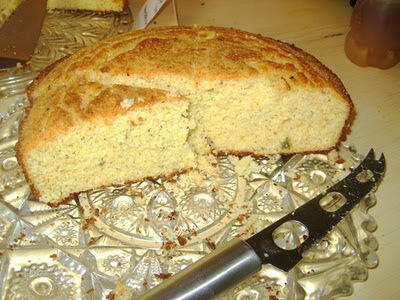 For the first Cornbread Supper of spring, 2011 -- and probably it was our second anniversary doing Cornbread Suppers, though we thought of this a bit late -- we opened with the official Cornbread Supper bubbly, J. Roget Extra Dry, and kept rolling right through some fabulous salads and savory dishes, all supported by a quartet of Cornbreads. We had Traditional Kentucky Black Skillet cornbread in the REAL traditional format (pork drippings) as well as vegetarian. We also had peppery cornbreads, laced with 2010 jalapeños from the Campsie garden (and freezer), in both porky and veggie variations.